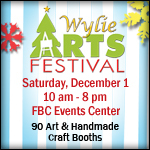 "The Wylie Arts Festival is the perfect opportunity to make a dent in your Christmas list or simply treat yourself. Stroll through the art and craft isles in the First Baptist Church Events Center and shop from the vendors hand-picked by the Arts committee to ensure a diverse, unique selection of quality handmade fine art and craft items. From jewelry to home décor to clothing to paintings to gift items you will not find anywhere else, there is definitely something for everyone." Event focuses on fine art of all disciplines including but not limited to painting, sculpture, photography; and handmade crafts in wood, leather, metal, ceramics and other materials. Separate pricing applies for Food & Beverage and Non-Profit Booths. Electricity will be provided (limit 1 outlet, please see vendor information for details). For more information, visit their website or contact their event coordinator, Carole, at carole.ehrlich@wylietexas.gov. For sponsorship information, please contact craig.kelly@wylietexas.gov.